Divorce can be awkward. When your friend tells you that s/he just got divorced, you can never be sure whether you’re supposed to say, “I’m sorry,” or “Congratulations!” Divorce gifts are no better. Divorce gifts can be funny, sensitive, crude or cringe-worthy! Sending a divorce gift to someone you know can either be a heartwarming gesture, or a huge social gaffe! Yet, divorce is definitely a noteworthy life event! If someone you know and love just got divorced, you often can’t help but feel you need to DO something. You need to commemorate the occasion somehow. Should You Send a Divorce Gift? Your relationship with the divorcing person. How that person feels about his/her divorce. In general, the better you know a person, the more acceptable it will be to send a divorce gift. At the same time, the nature of your relationship to that person matters a lot. Similarly, before you send anything, you have to know whether the divorcing person is happy or sad about his/her divorce. Sending a cake topper that says “Free at Last!” to your cousin who is still devastated because her husband of twenty years just left her for the babysitter is probably not a good move. Another thing to consider when sending a divorce gift is the nature of the gift itself. Flowers and chocolate are usually okay no matter what the circumstances. A wineglass that says, “Adios Motherf****r” is probably not. Once you’ve decided to send a divorce gift, of course, you then have to decide what to send. Here are some of the most interesting divorce gifts on the market today. These T-shirts are for those who are happy about their divorce, and willing to wear to share their joy in public. Women’s Divorce T-Shirt. “And She Lived Happily Ever After (the Divorce)” may be slightly more polite than the men’s version. For those who may not be ready to wear their divorce quite so openly, divorce socks can present a more discreet alternative. They are a little bit wild, but they still provide a little humor in a less public way. For those who prefer not to flaunt their divorce in public, a divorce coffee mug can still make a statement. Divorce Definition Mug. This divorce mug is simple and on point. It’s Better to Have Loved & Lost Mug. This divorce coffee mug has a little bit stronger brew. Therapist Mug. This coffee mug works well for anyone who’s divorced, as well as for most parents of adult children. For those who prefer something a little stronger than coffee, there’s nothing better than an artisan divorce wine glass. To fill your divorce wine glass, of course, you need a little divorce wine! 6. Home and Office Divorce Decor. Tired of listening to your ex prattle on? This button can interrupt the conversation and let your ex know what you really think! Divorce Diploma. For those who want to prove they have graduated from “divorce university,” this nicely framed plaque is the perfect gift. 7. Gifts for the Divorced Golfer. These golf balls say it all. For some divorced people, there’s no better way to celebrate the season than with a divorce Christmas ornament. This ornament will remind you to count your blessings. season. For those who need a replacement for their rose colored glasses, these “Just Divorced” shades can be the perfect gift. 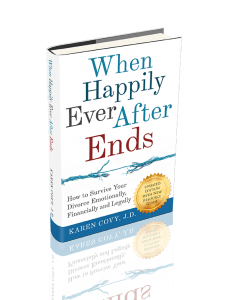 For those who want to take a more cerebral approach to the end of their marriage, these divorce recovery books make fabulous divorce gifts. It’s OK That You’re Not OK. If your friend is struggling to put divorce behind him/her, this book can help. I Hate My Ex-Husband Coloring Book. This book may be crude, but coloring is supposed to be an awesome stress-reliever! The New Old Me. This divorce recovery book is perfect for the divorced person whose trying to build a whole new life. TIP: Divorce books make the perfect gift for those who are still in the throes of their divorce. Here are 27 of the BEST DIVORCE BOOKS you can find. Divorce gifts are definitely not for everyone. You obviously need to be sensitive before sending one. But, if you’re looking for a way to lighten your divorcing friend’s day, there’s no better way to do it than with a thoughtful (or funny!) gift! NOTE: Most of the links to the gifts on this page are affiliate links. If you buy these books using these links, I will get a small commission from Amazon. You are welcome to buy these books from anywhere you like. The Amazon links are just here for your convenience. Absolutely love some of these and yes for the first time in what feels like forever I LAUGHED out loud! This article helps me allow myself to be light-hearted about my divorce. It doesn’t have to be terrible!